When it comes to marketing on social media, or anywhere online for that matter, the success of your campaigns all come down to their content. Without content there is no marketing. But, what if you’re creating tones of content, but you’re still not seeing the results you need? The chances are you’re not getting enough engagement. So it won’t matter how much content you keep pushing, if it’s not engaging your audience, it’s not worth posting. Before I tell you how to create more engaging content for social media, I want to explain what I mean by engagement and why it’s so important. Post engagement is when some one likes, shares, clicks or comments on a post in your feed. They’ve interacted with one of your posts in these ways because they feel drawn to it and connected to it’s message. Getting post engagement is the most important part of social media marketing, because when people are engaged it means they trust you. Your post engagement trumps how many follower you have and it should be the number one focus of your marketing strategy. Having tons of followers is great, but if they’re not actively engaging with you on your platforms, the chances of them ever becoming a customer are very small. I would rather have a handful of fully engaged followers, who believe in my brand and my message over thousands of followers who probably don’t even see my posts from one day to the next. We want to get new customers from our social media channels right? So we need to make sure they’re engaging with our content. How do we do that? We connect with them on an emotional level. It’s proven that when we care about something we’re more likely to share it with our friends and family. Like when you’ve had a really great day, eaten at a fantastic new restaurant, or worked on a really interesting project, you can’t wait to tell someone about it. The same behaviour applies on social media. When we feel emotionally attached to the content in our feeds we react to it. Think about the kind of posts you like on social media. You seek out the content that resonates with you. And the emotional connection is created because you feel like who ever created that post totally gets you. This quote from Jonah Berger is so true of social media behaviour. When a post connects with us in an emotional way we want to tell other people about it, because there’s a high chance they’ll feel the same way you did when you saw it. How Do You Get Emotional? If you want to start creating more emotional content, you have to know your brand inside out and know your audience even better than that. And I’m not just talking about demographics, you have to go much deeper than that. I’m talking about understanding your audiences feelings. What drives them? What do they passionate about? What gets them excited? These are questions you need to have answers to. Then you have to connect those feelings with your own brand. Think about what your purpose is, what do you want to achieve with your product or service and why is that important to you, and line those things up with your audience. Why is your product or service important to them? What problems do they have that your product or service will solve and how will they achieve their goals with it? But you cant just tell your audience you’re emotionally connected to them, and that it’s ok to trust you because you understand their feelings. They have to decide that for themselves. Use your content to show your audience how much you understand their needs. Use it to solve their problems and give them a reason to care about you. Make your content the thing between where your audience is and where they want to be. 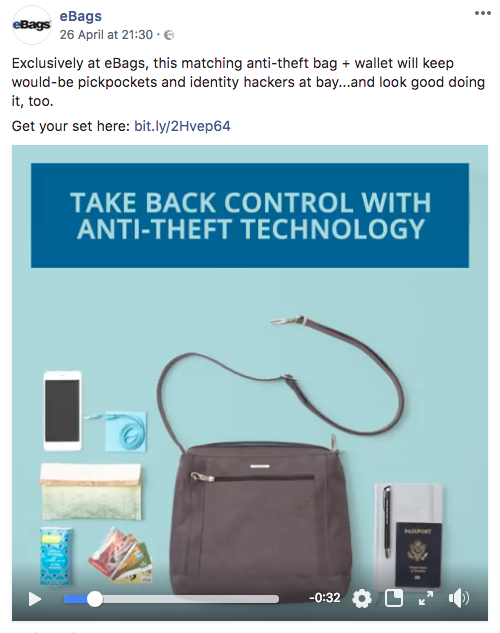 In the first post they show the audience that they understand their concerns around theft when they’re traveling, so they show them how to keep their belongings save in their specially designed anti-theft bag. In the second video they demonstrate that they are experts in cruise travel and can show you how to pack accordingly. 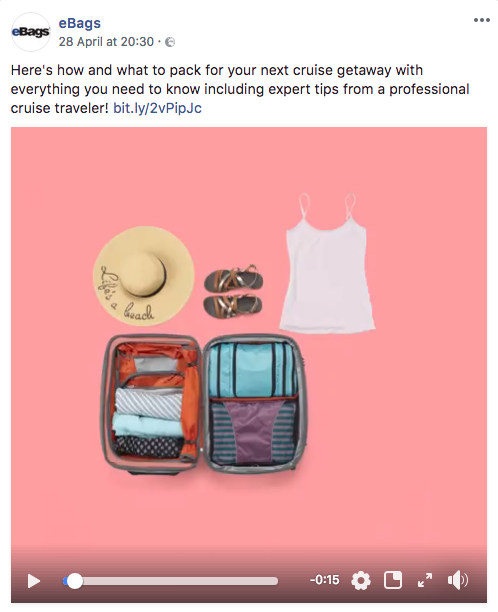 Ebag use their posts to solve problems and show their audience that when it comes to travel they really are the experts. So if you want your posts to get more engagement, you have to get emotional about it. Become a Digital Marketing Unicorn With my Newsletter. Every 2 weeks you&apos;ll receive advice on digital marketing strategy, evolving your online brand and connecting with your target audience.